David Ripley has confirmed his Northants budget has been cut for the second year in succession. But the head coach is confident he can continue to unearth gems and develop academy graduates to keep the County strong for the seasons ahead. Ripley has enjoyed a fine season at the helm, steering Northants to the NatWest T20 Blast final. They only missed out on a place in the Royal London One-Day Cup quarter-finals on run rate and they are currently third in County Championship Division Two. But the coach will have to continue working on a shoestring budget as counties across the country battle to survive. “Obviously the budget is tight so we’ve got to be a bit creative if we can,” he said. “The budget hasn’t been signed off yet so we’re still waiting for a final figure we can work on. “We know it’s not going below a certain level, which is why we’ve managed to re-sign some players, but we’re hoping to get clarification of the budget soon. “It’s definitely going to come down. It came down last year, and it will come down again this year. “Hopefully we’ll find our level before too long. We don’t want it to keep coming down every year, that’s not great. “The club has been in a tight spot this year and it’s important we work within our means. So how tough does that make life for Ripley? “It brings different challenges, but we’ve got to keep our head up and keep seeing what’s around,” he said. “We’ve also got to work hard to develop our own players, so Saif Zaib has made his first-team debut this year. “You’ve got to keep finding options because the chances of us picking someone up from another county that hasn’t been released is very low. “We’ve got to find players who are a bit blocked at other counties and can’t find their way into the first team as they would like. Two men who fit that category are Charlie Thurston and Richard Gleeson, who were both in the squad for the County Championship Division Two game against Glamorgan at the County Ground this week. Ripley explained: “Charlie Thurston is a Bedford School boy who was on the Middlesex Academy. “He’s played for our second XI and got a double-hundred against Durham so he has been contributing. “We had a doubt over Adam Rossington so Charlie was in the squad and if Adam hadn’t made it he would have played as a batsman. “Ric Gleeson has been in good form in the second-team games he’s played, getting three five-wicket hauls in three matches. “He obviously played against Australia and picked up a couple of wickets, Mitchell Marsh and Shaun Marsh. Meanwhile, David Willey has been doing what he does best for England. The Northants star took three wickets in a fine fourth ODI win against Australia and also claimed one in the final match, at Old Trafford on Sunday. 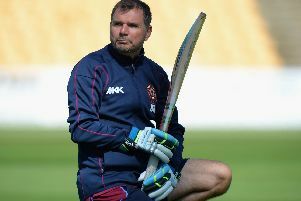 He will be moving to Yorkshire at the conclusion of this campaign, but Northants will not be able to spend the compensation they received on new players. “We can’t reinvest any of that, but we did get some money for Dave,” Ripley said. “I’m not entirely sure what the figure was but we did get some compensation, I don’t know how much or how it’s paid but the club did pretty well out of it.